The latest numbers on the US economy were positive. As a promising sign for the future, the global manufacturing environment may be showing signs of stabilizing – coincident with a stabilizing of commodity and international equities prices. I still believe the Fed will continue to hold and will not raise rates in April. 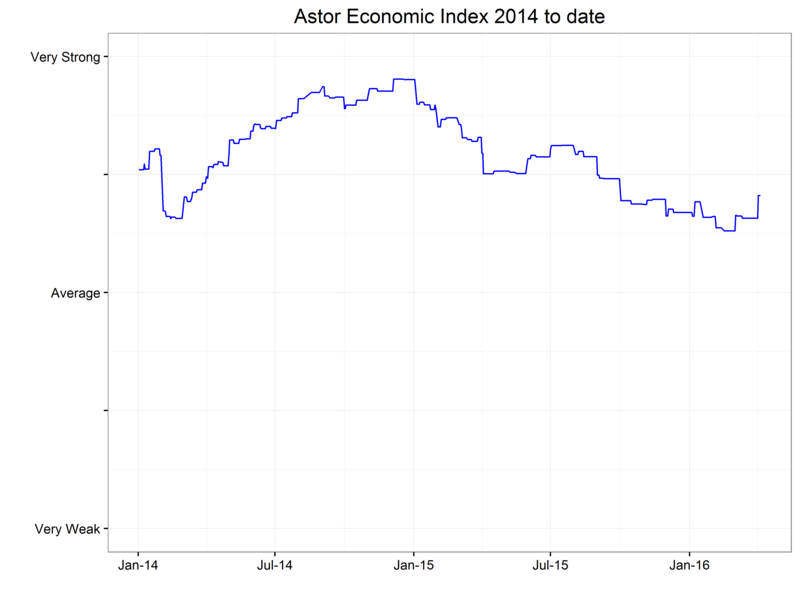 Our Astor Economic Index® (“AEI”) shows growth somewhat above the recent average and stronger than last month. 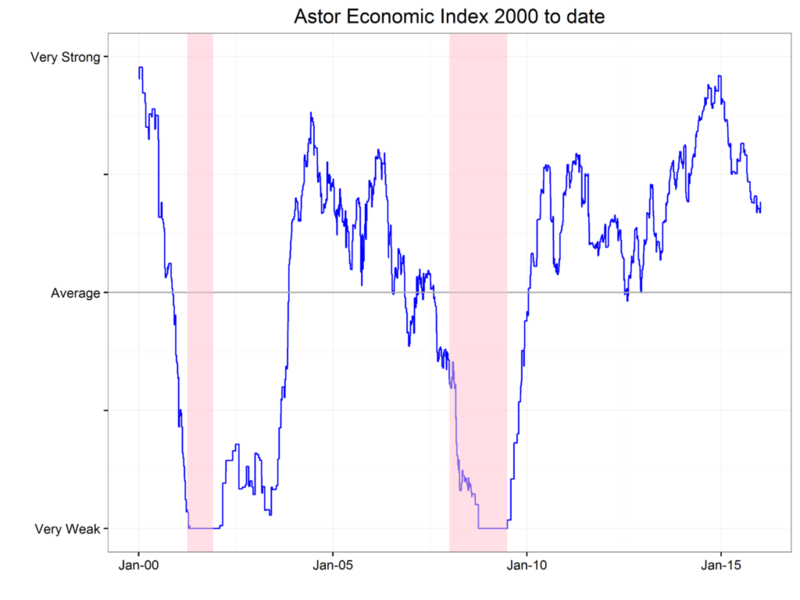 The AEI is a proprietary index that evaluates selected employment and output trends in an effort to gauge the current pace of US economic growth. The employment report (nonfarm payrolls) for March was broadly positive. The number of new jobs was again quite close to its two-year average. 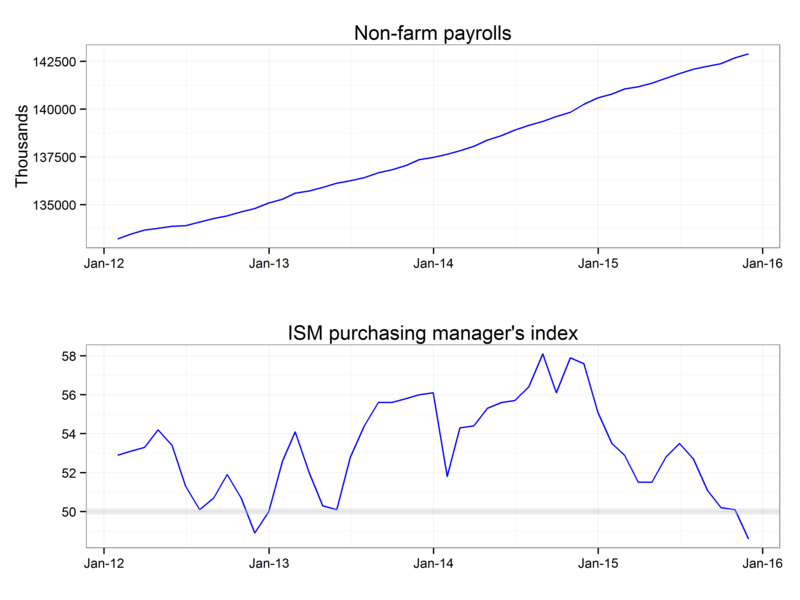 We can see no sign of broad based weakness in the economy within the payroll numbers. The tick up in the unemployment number was welcome as it represents more people looking for work who were previously on the sidelines of the labor market. The prime age employment-population ratio has improved markedly in the last quarter, though it is still lower than the previous expansion. Despite this good news on the employment front, the preliminary release for GDP for the first quarter of 2016 – due at the end of April – is likely to be weak. 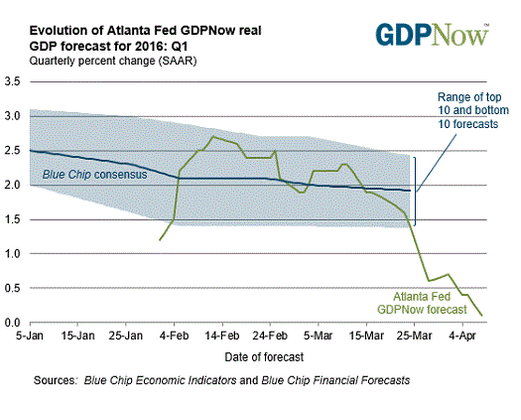 The chart below shows the Atlanta Fed’s current estimate of first quarter GDP calculated via their GDP Now methodology. 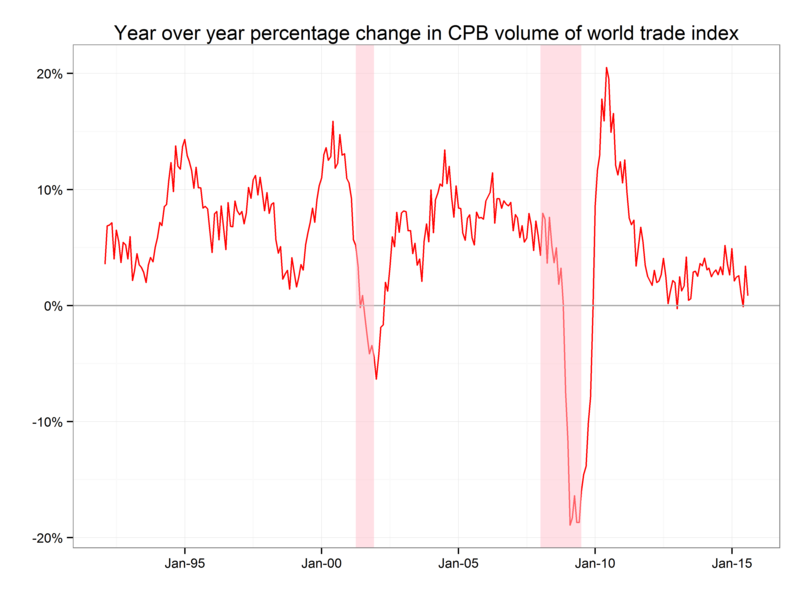 The weakness – if it materializes in the final numbers – can partially be put down to a higher trade deficit and an inventory drawdown both of which can be transitory. Weaker consumer expenditures is more concerning. It is also worth noting the BEA is considering a secondary seasonal adjustment to try and account for the pattern of unusually weak first quarters which economic observers have been subjected to over the last few years. For several months we have been highlighting the weak international manufacturing environment. 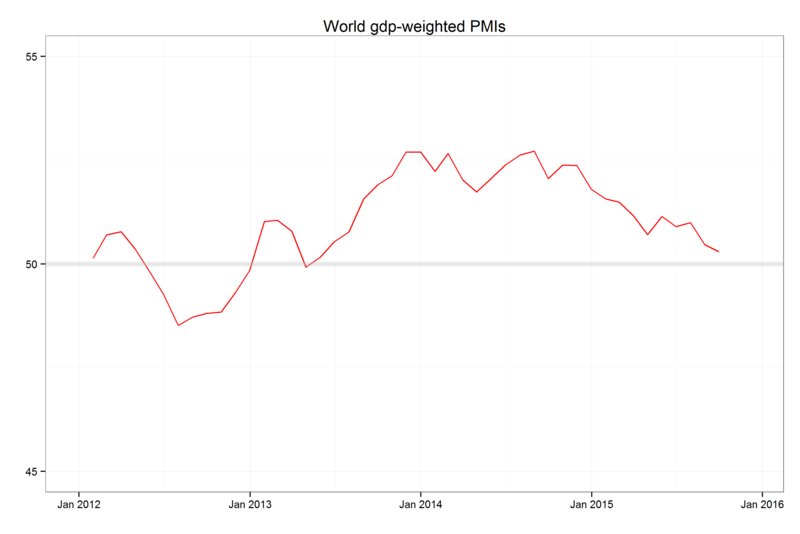 This weakness is most easily seen in the chart below of global manufacturing purchasing managers indexes. 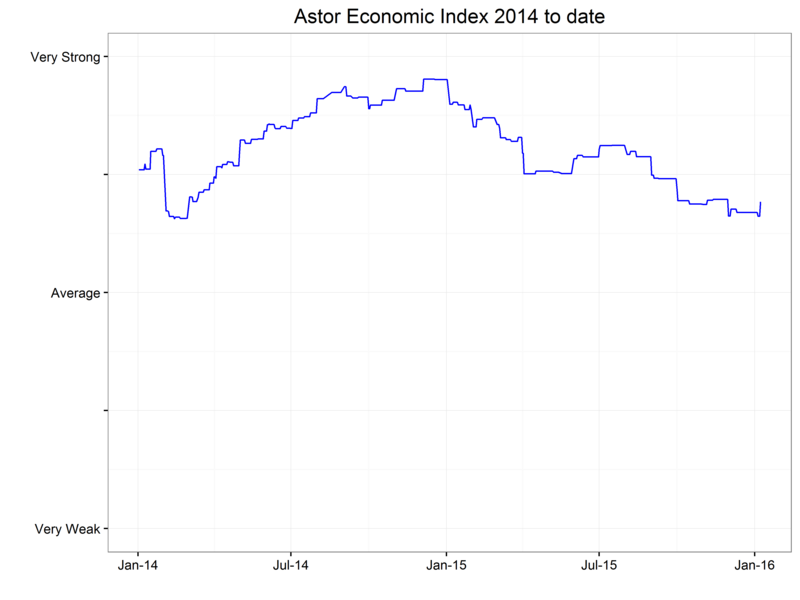 which have shown sharp deterioration over the last year. The latest numbers show a bit of an improvement so perhaps we can be hopeful, though careful readers will recall similar optimism in February’s read. If this bounce continues, it is possible that some of the external weakness in the US will begin to be reversed. The Federal Reserve chose not to raise rates in March and statements since lead me to believe the hawks on the committee have become somewhat convinced the prospect of a weaker economy poses a greater danger than the specter of run-away inflation. 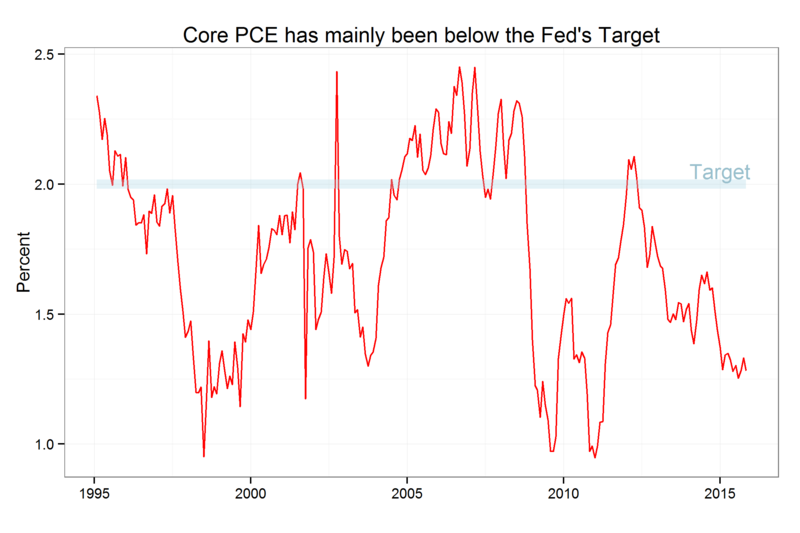 The official stance is the FOMC wants to be convinced inflation is heading back to its target – somewhat above current levels. 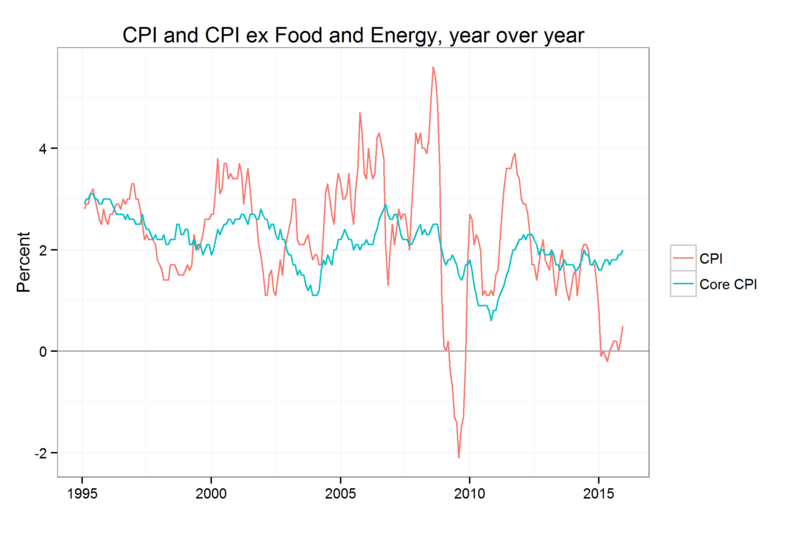 I would expect the reversal of recent trends in the dollar and crude oil prices will both tend to move inflation higher in coming months. The latest data we have shows the Fed still sees an additional two to three hikes in 2016, while the market predicts about one. 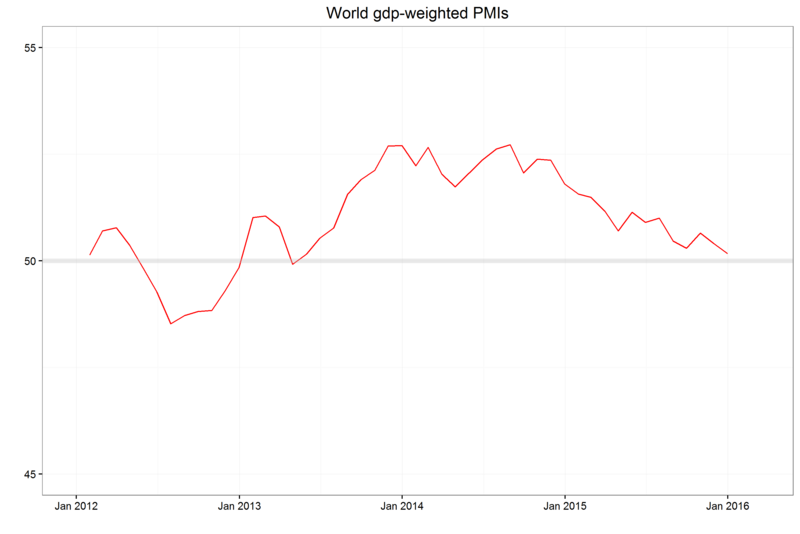 In short: The evidence today suggests to me the US continues another month of positive if somewhat tepid growth. As always, there is considerable uncertainly but I think the market underestimates how much the Fed may raise rates. 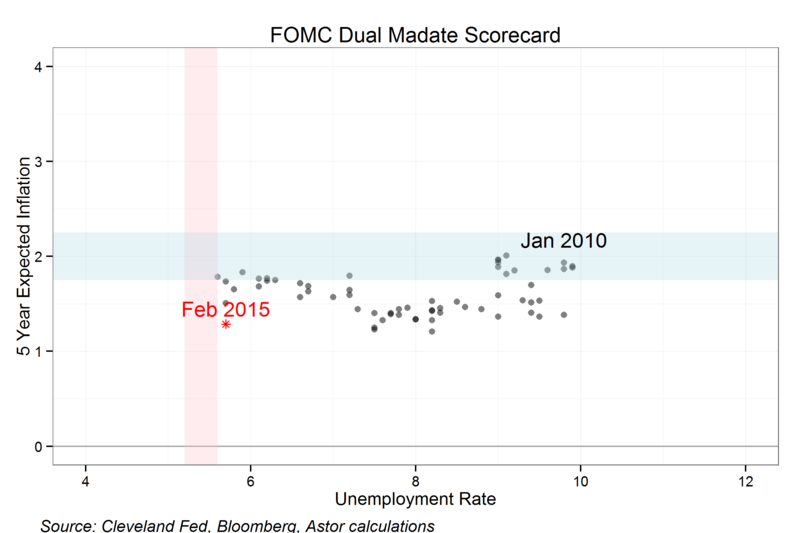 The chart below shows where the economy is relative to the Fed’s dual mandate of full employment and stable prices. The horizontal blue area is a band around the Fed’s 2% inflation target and the vertical pink ribbon is the FOMC member’s estimate of the full employment rate of unemployment. The Fed adjusts monetary policy to nudge the economy toward the intersection of the two shaded areas. Considering where we were in 2010 and the criticism of their actions, we should admit that the FOMC has done a good job over the last several years. Part of the difficulty with monetary policy is that there is a disconnect between cause and effect. The economy is not a pool table, with each action being in principle calculable from initial conditions. The Fed’s actions are subject to long delays the effects of last year’s easing or tightening works its way through the system. For example, last week Vice Chairman Stanley Fischer said that the thought the effects of quantitative easing and forward guidance on the economy would not peak until 2016, this of a policy that began to be wound down a year ago. (see his speech or the underlying research) Imagine driving a car with an unknown delay between touching the brake and the car slowing and you will have the idea. Which brings us around to the question of why is the Fed talking about raising rates now? There are still people out of work, more working part time and still more who left the labor force in the great recession. Even though inflation is low, public comments by several members have led me to believe that it is the uncertainty about the timing of the effects of monetary policy, and the continued stimulus from QE which is still in the pipeline, that will cause the Fed to raise rates shortly. An action consistent with a hike in the second or third quarter would be for the Fed to change its forward guidance language at the upcoming March meeting. According to Chair Janet Yellen’s recent congressional testimony, such a move will mean that a rate hike is possible, though not ensured at the next meeting. The practice whereby the fed has been explicitly telegraphing its moves months in advance has been known as Forward Guidance, and is itself believed to be a very significant part of the Fed’s easy stance. That is, by giving strong suggestions, if not quite guarantees, about the future course of short term rates the Fed has shaped expectations which are such a key component to interest rates. This anomalous circumstance is likely to end in a few weeks and the Fed hopes to resume its accustomed inscrutability shortly. Absent a rapid deterioration in the economy it is likely that the new hiking cycle since 2004 will finally begin in the summer or fall. I am concerned that the fixed income market, jaded by repeated disappointments of the Fed failing to raise rates, has convinced itself that the fed will not be aggressive when it finally does so. 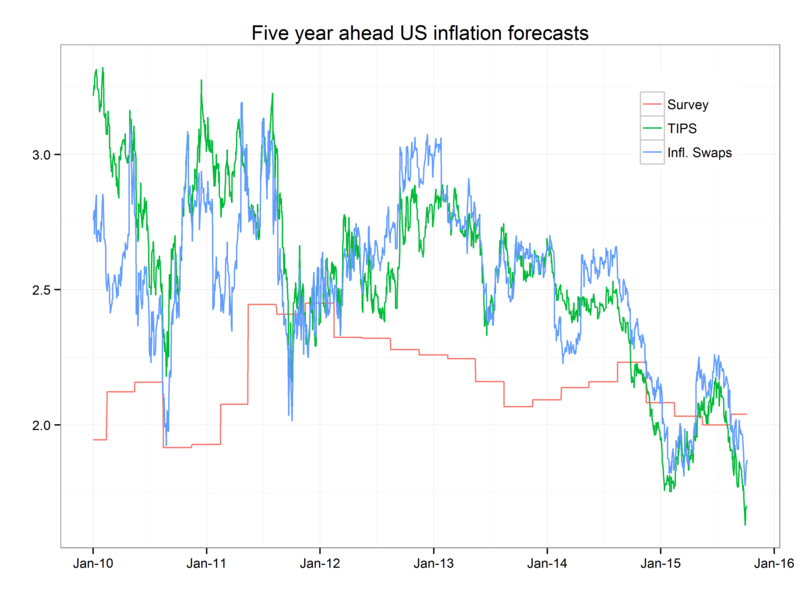 This chart shows forecasts of the fed funds rates from three sources. 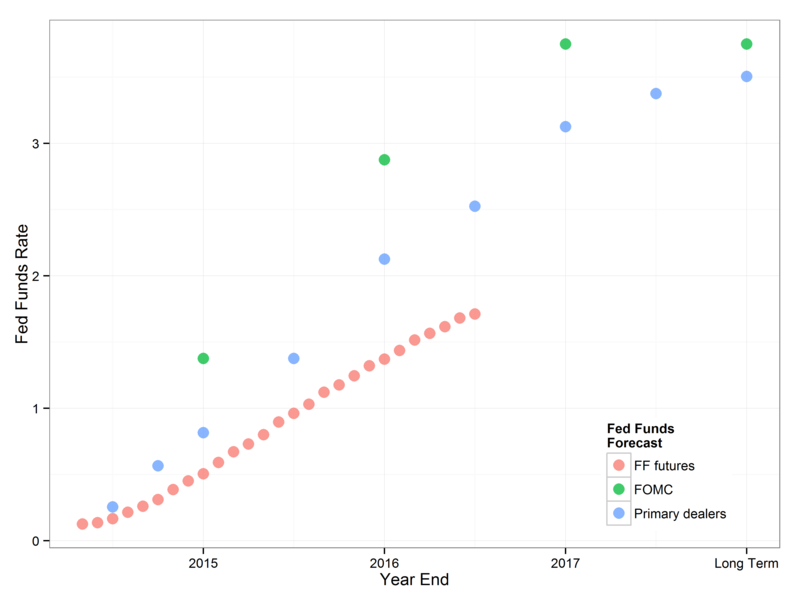 The lowest, red dots are derived from fed funds futures, the middle, blue dots are from a survey of primary dealers, the highest green dots are from a survey of FOMC members. There is a 85 basis point difference between the expected end of year rate for 2015 between the fed fund futures market and the FOMC with a larger difference the following year. Repeated disappointments have led the market to doubt that the fed will be aggressive when it does begin to raise rates. Recalling the last two tightening episodes may be sobering. In both 1994 and 2004 the economy was slow to come out of recession – the recovery from the 1991 recession was the original “jobless recovery”. 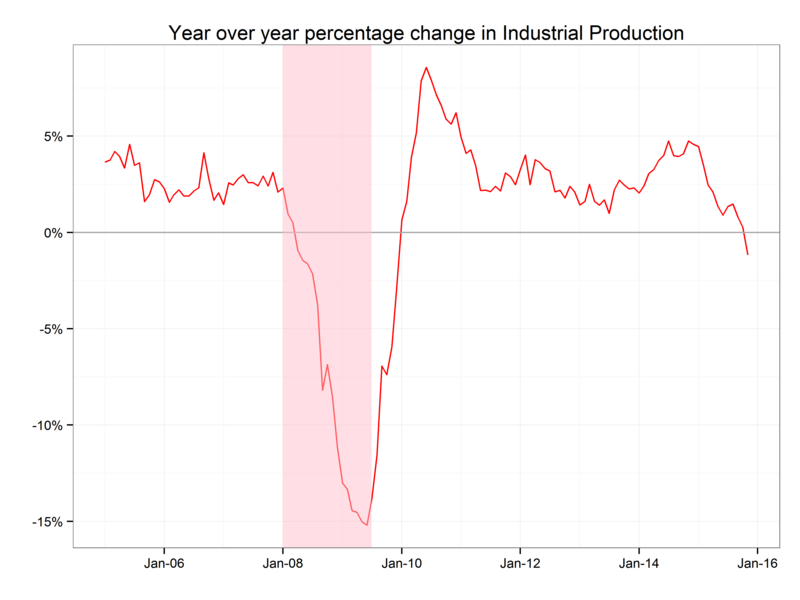 Signs of economic slack and tame inflation allowed the Fed to keep rates lower for longer in these recoveries. But when the fed raised rates it was far beyond what the market had anticipated, perhaps lulled by a lengthy period of easy money. In 1994 the market was expecting 100 basis points in two years and got 300 basis points in just over one. A similar mismatch between expectation and reality took place over the feds 425bp hiking jag starting in 2004. It is hard to say how likely the Fed is to tighten aggressively. On the one hand uncertainty about the amount of slack left in the economy and low rates of other developed nations are likely to lead to a lower funds rate. On the other hand, the consumption-reducing rebuilding of balance sheets by banks and consumers seems to have been completed, leaving them better able to spend. There is little theory to guide us. James Hamilton and his co-authors detailed recently that economists have not found a clear, empirical relationship between economic growth and a neutral real (that is, inflation adjusted) fed funds rate. We cannot generalize from economic growth or inflation dynamics to where the fed will stop raising rates once it starts. In addition to fed funds rising, perhaps more and more quickly than the market anticipates, there are signs that some on the FOMC desire fiscal conditions as a whole to be significantly tighter. I am thinking here of two speeches by NY Fed President Bill Dudley who I see as being representative of the vital center of the committee. In a speech last year President Dudley said that the FOMC needs to pay closer attention to financial conditions and that if measures like the ten year yield moves in an easier direction while the Fed is tighten, then they may need to raise more aggressively to make the market get the message. As always, my thoughts should be assumed to be seasoned with a heavy hand of humility, we can expect the markets to surprise us over the rest of 2015. However, with the Fed looking to raise rates with firm growth in the US, and a decent outlook overseas, I see a significant chance of a meaningful upward move in yields this year.